What do you know about Eastern Michigan Eagles Football History? 1. What are the official team colors of the Eastern Michigan Eagles? 2. 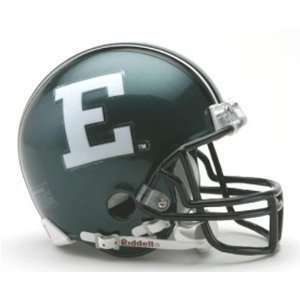 Up until 1991, the Eastern Michigan Eagles had a nickname that was associated with a Native American group. What was it? 3. Who was the first Eastern Michigan head coach to win 100 games with the team? 4. What is the name of the Eastern Michigan Eagles marching band? 5. Eastern Michigan football player Jason Jones was drafted into the NFL in 2008. What position does he play? 6. In 1987, the Eastern Michigan football team defeated San Jose State University for the school's first-ever bowl victory. What was the name of the bowl game? 7. What is the official mascot of the Eastern Michigan Eagles? 8. In the early 1980s, the Eastern Michigan football team lost a woeful 27 straight games. Who was the head coach at the time? 9. What is the official fight song of the Eastern Michigan Eagles? 10. Eastern Michigan football player Barry Stokes (guard/tackle) played in the NFL for several teams starting in 1998. He retired in 2008. For which of the following teams did Stokes never play?